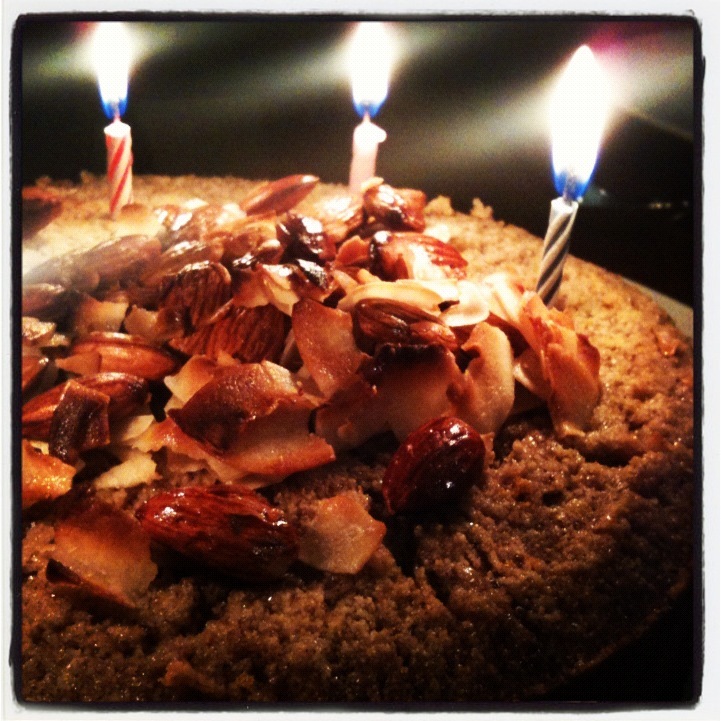 Almond Marzipan Cake… Birthday show off!! In the good sense of the word. It’s my parents birthday today and it’s the perfect reason to go high falutant all the way with their birthday cake, something way fancier than the usual Tuesday night muffins or the movie night cookies. It is all an experiment without plan so I’m deciding what else to put on as I go, let’s see what happens! We often prepare raw almond milk and I like to collect the remaining “almond meal” for making other stuff, usually cookies, or CAKE, and happens that my dad is a crazy almond lover. 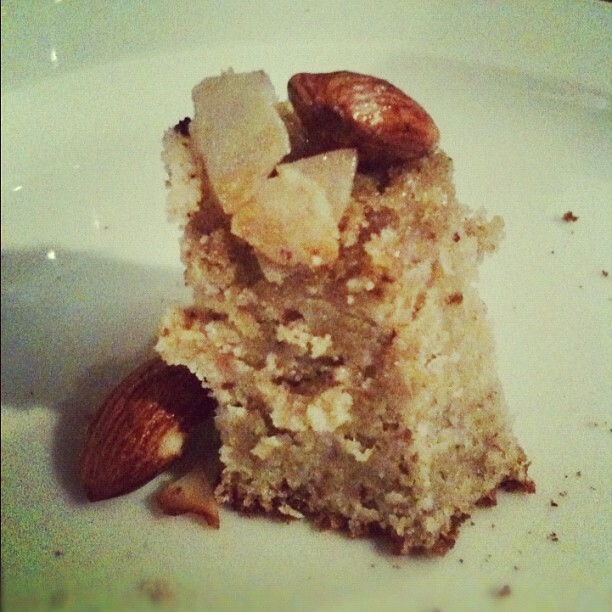 Working our way to reduce soy in our diets we have a lot of almond meal right now which means this will be a thick heave cake. So far here it goes.. Pressed into an oiled pan and into the oven at 420F for an hour or until golden. On a separarate frying pan place..
Flambee until all the alcohol evaporates and pour on top of the cake as soon as you take it out from the oven. Yes… that is me! Ja! But seriously, don’t you sometimes need to leave everything out the kitchen and just enjoy a simple, easy, relaxed time? The world will be there tomorrow with all that is happening now… but ‘now’ will not be there tomorrow so you need to enjoy it, well, NOW. Tonight I feel that way so we are having muffin night. We’ve been so busy with the Ninjapalooza, making Vinomio, etc. 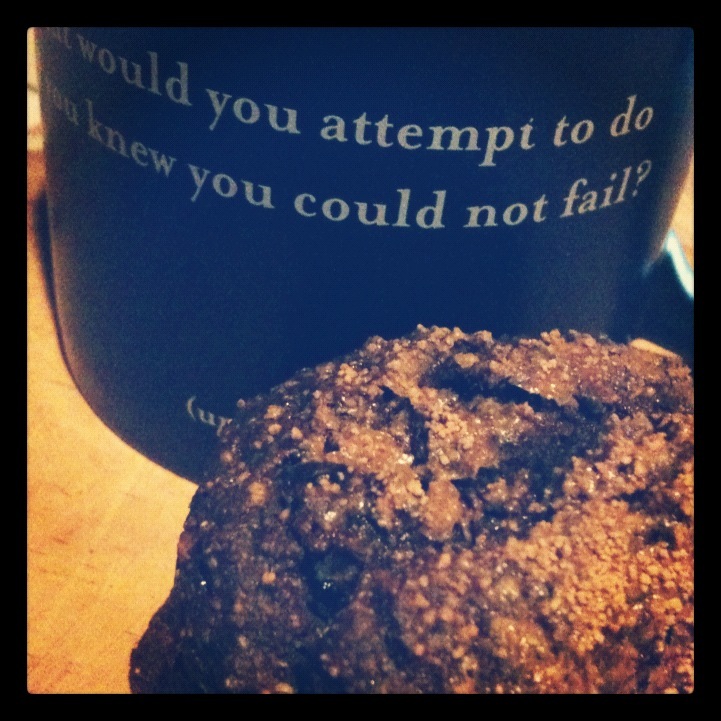 Sometimes having vegan muffin night has therapeutical powers! For the grounded flax seed, amaranth and quinoa I use a coffee grinder. 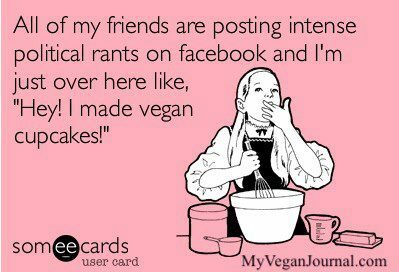 You can also use a blender (although sustitute the amaranth for more quinoa since the blender won’t break the amaranth) or buy the flour already grounded at the store. I figure is best to have the whole grain and ground it myself, some of the flour you find at the store is from grains that were grounded months ago and have lost a lot of it’s freshness by now and also I feel the difference in my body, homemade is always best, it’s time to re-define homemade! Ok, start by heating the oven at 450 degrees, mix all the dry ingredients in a large bowl until they are well incorporated. Now add the rest of the ingredients little by little mixing throughly, start with the oil, then the avocado (you can also use apple puree, silken tofu or vegan yogurt) and then the milk. Pour into an oiled 6-muffin tray and into the oven for 25 minutes! 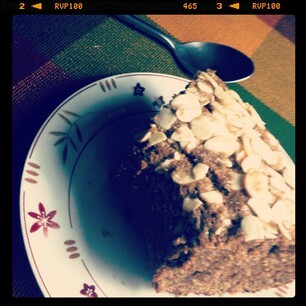 One tip, you can sprinkle a bit of cinnamon and sucanat at the top to get a crumbly sweet crust! and have a coffee mug with some wise advice next to you, that also helps!! got milk? 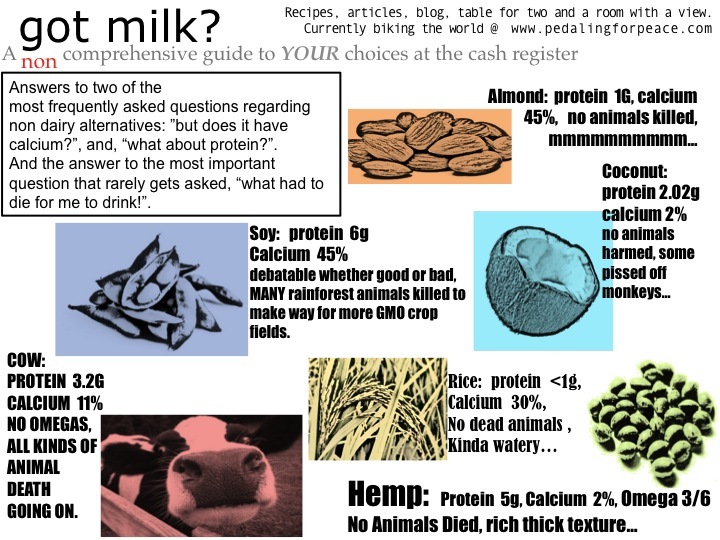 A NON comprehensive guide to alternative Milks. Super quick one today….. 2 tips. The first is using papaya seeds. Eat your papaya and save all the seeds, evenly spreading them out on a plate to dry in the sun in the windowsill. After about a week, place the seeds in a mortar/pestle or a coffee grinder and viola! You now have a spicy pepper substitute that will help you digest your food! Aloha and enjoy your life! Start with the sauce, it has to simmer…. Make sure and cook your noodles if you have cookable kind! If you are vegan, read your labels, a lot of noodles have egg! Tomatoes, lots of them, A lot of times I use two big cans of tomatoes. If you can get fresh, waaaay better, the less processed the better, canning kills important stuff, try and remember this… simmer them with red peppers and garlic, parsley, oregano, basil, salt, pepper, this is a ”to taste part” of the cooking, you are going to want a full blender and a half. Start by browning the peppers and onions, then add garlic/parsley/oregano/basil, when everything is browning nicely, add the tomatoes and let it simmer for, well, a long time, and maybe add a little sugar, natural sugar, cuts the acidity, use a tablespoon at first… taste this one a lot, its a key component…. fresh basil to taste, usually 15-20 leaves finely chopped, or rough cut, either way… dry basil fine too. I like “tofurky” Italian sausage, also, feel free to use tempeh, if using tempeh, 2 packages to be safe. Feel free to get creative, add eggplant, asparagus, whatever you want as a filling. This is cooking, not rocket science, so be CREATIVE. The sauce should be right as rain now, turn it off…. You could have preheated the over, but lets be energy conscious, this isnt bread, it’s lasagna, it doesnt have to be preheated! Place it in at 350 for 45 minutes, when its hot and really bubbly, you’re set. Get it on the table, depending on how big you are wanting to go, make a nice salad with dark leafy greens, sprouts, light dressing made from Apple cider vinegar (unfiltered raw is healthiest and tastiest), olive oil, kalamata olives… Wine, red is nice, but so is white (I’m not drinking so, you know, do what you will=), sparkling water is great, and so is tap, bread, well, you really should have a baguette on hand, get good bread or make it, good bread only costs about 2 dollars for a fresh loaf…. Rock and roll, enjoy and Aloha!